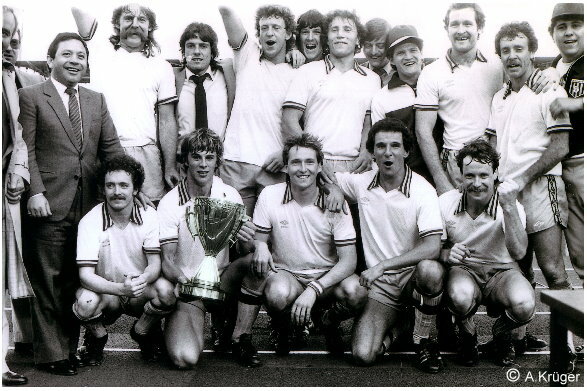 1982, Wilson played his last game ever with APIA Leichhardt vs Heidelberg United in Melbourne. During the game Wilson crashed heavily in an air battle with Jim Campbell. 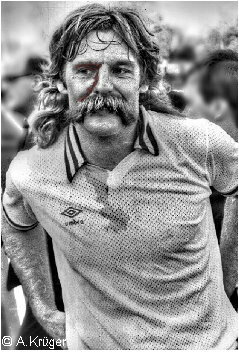 However, he played in spite of a strongly bleeding wound, a deep cut above his right eye, and led his team to a famous Cup win. After Wilson left the Melbourne Olympic Park field, he never again played an official football match. It was a quiet departure of one of the best Soccer player of all times in Australia. The Phillips Cup win was a highlight. After that there were some complications at APIA. The biggest problem in 1983 was that Peter wanted to Captain Coach and the committee only wanted him to coach so he told them where to go. "I have finished playing soccer now. I was not enjoying coaching, so I gave the football game up completley"
Wilson in a private letter, 1984.